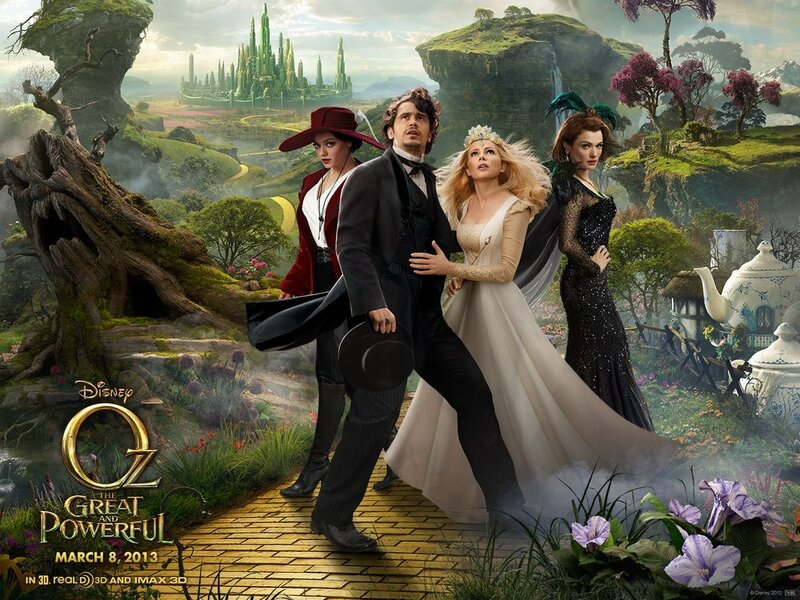 Movie Review- Oz the Great and Powerful — Always Packed for Adventure! My second theater experience in England was very different from my first. Dan and I went with his five year old daughter to see Disney's Oz the Great and Powerful at the Vue Cinemas in Newbury. In contrast to the theater at the Corn exchange, Vue is a megaplex in a modern building. Here is the town view from the enormous windows in the lobby of the cinema. A big thanks to Dan's parents for not only treating us to the movie, but splurging for the upgraded seats. The seats that we had were reserved seats in the dead center, best spot in the theater. The upgraded seats were not only in the best spot, but they were wider with more leg room and plusher. Very nice! I read many negative reviews about the movie and went in thinking that I was going to hate it. It was the only movie appropriate for Dan's daughter, so it was the only option. I didn't love the movie, but it was much better than anticipated. It had way too much CGI, especially early on in the film. It was unnecessary and just didn't look very good. The movie nearly lost me at the start, because I really didn't like the entire set up in Kansas. It was stylized and bizarre. Although it set up the characters, it didn't seem to mesh with the rest of the movie. Loads of Corny bits, especially in Oz with the Munchkins. This is one of those movies that's aimed directly at kids and not at families as a whole. It does have some dark scenes, but Dan's daughter wasn't frightened at all. It doesn't look like it from the trailers, but this is a movie for kids. It was a bit like (although a tad better) last year's abysmal Snow White movie, Mirror Mirror. I feel like it's always a bit of a failure when a family movie isn't enjoyable for the entire family. The movie lacked the creativity of The Wizard of Oz. One of my favorite aspects of the 1939 movie, was when Dorothy and the gang go into the Emerald city and it's like this whole self contained world. The movie didn't have a good sense of place. The world of Oz was just a CGI fest. For a movie with so much going on, there was a distinct lack of urgency. When Oswald first arrives in Oz, he just quickly accepts the fact and acts like everything that is happening to him is completely normal. Maybe because it's a kids movie and there are a lot of characters and plot to cram in, but it seemed like everything that happens to the characters is accepted very quickly and they move forward. Most bizarre is Mila Kunis as the Wicked Witch, she starts out as a sweet and good character, but is transformed into pure evil with the quickest turn around. She has a motive, but it happens so fast that it's hard to buy. We didn't see it in 3-D, but it easy to see every single 3-D gimmick. This movie is very gimmicky. There was some stuff that was well done. The movie is well cast, although clearly all of these actors probably wish that they could have the paycheck and leave the movie off their resume. I liked the tie-ins to The Wizard of Oz, such as having the same actor play a character in Kansas and also in Oz. Although, I felt like Mila Kunis should have played the woman that Oswald seduces at the carnival, as it parallels her situation in Oz. This was a story inconsistency to me. I have not read any of the Oz books, but I liked the origin story for the wizard and the witches. It worked. It would have worked better in a movie aimed more at adults. It could have been darker, like my favorite Oz movie, Return to Oz. I thought that the movie ended with a nice moral. The wizard is not a very commendable or likable character for a majority of the story, but it ended on a positive note, a story of friendship, courage and right over might. Ultimately, this movie had the nuts and bolts in place, but could have been made more thoughtfully. It was lacking enough to make it hard to recommend to anyone over the age of ten.